The nights are drawing in, the cold is getting deeper, and the holidays are approaching faster than you care to think about. Look on the bright side though… It’s time to get the fireplace going in earnest and let the dancing flames and their healing warmth work their magic. Whether you are an ‘early decorator’ or a ‘last-minute rusher’ to get your home ready for Christmas, we are here to help you make sure it is a safe and warm one this year. Read on for our tips on how to keep your fireplace free from hazards, yet still have a beautifully decorated home. And we haven’t forgotten about the little ones who are probably already overexcited and wondering how Santa can squeeze down through your wood-burning stove pipe. Have your flue and chimney inspected each year. A check will identify and remove any potential blockages from debris that has blown in, any animal or bird nests that may have appeared, cracks in the brickwork, or a build-up of creosote – better known as soot. Checking that your damper is open. You want to open it before you light the fire and only close it once the ashes have cooled. Use a screen for an open fireplace or glass enclosure for a stove. Check them for any cracks or holes and make sure that the seal around your stove’s glass door fits well and is not cracked or has come loose. If you want to hang your Christmas stockings on the mantelpiece, go ahead. But remember to remove them before lighting a fire. In fact, remove anything that is hanging below the mantel – stockings, Christmas cards, garlands, and other decorations. You may be better off hanging things either above the mantel or to the side of the fireplace to avoid having to remove and re-hang things each time you want to light the fire. Always, always, always use a screen for an open fireplace, especially at Christmas when your room is filled with flammable items that can easily ignite from a flying spark. Keep your Christmas tree at least three feet away from your fireplace and stove. 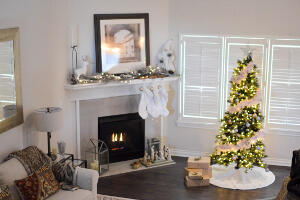 If you are using an artificial tree, check that it is a fire-resistant one. If you have a wood-burning stove, avoid hanging any decorations on it. Instead, place them on either side at a distance of three feet. On Christmas Eve, while you can hang the stockings on it you should only do so after it has fully cooled. whenever you need us. And have a wonderful Christmas, whatever you are doing this year.